For most people, clutter and garbage are their worst nightmare; at Junk Raps, we think that clutter and garbage are the stuff that dreams are made of! As a full-service junk removal company that has been servicing the residents and business owners of Long Island for several years, we can honestly say that we are passionate about your junk (and your garbage, too!) Because of our commitment to our customers, our efficiency, and our high-quality service, we have developed a glowing reputation – and that is something that we are extremely proud of. In fact, when people need a dumpster rental Long Island, a carting service, or they need help with junk removal, we are the first company they call! Junk Raps isn’t like other junk removal companies. We know that your time is valuable and that you have specific needs. Unlike other companies that work on their time and their schedule, Junk Raps works around your schedule. We never set time limits, so you’ll never feel rushed. When you choose us for your Long Island dumpster rental needs, you will be able to take your time so that you can get the job done on your terms. 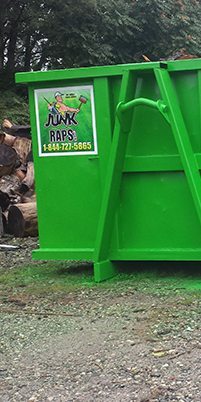 Whether you’re a contractor who needs a container to hold refuse from a demo, you are a homeowner who is renovating your house – or you just want to make more space – you can be sure to find the right dumpster for your specific needs at Junk Raps – and you can keep it as long as you need it. And, once you’re done with your Long Island dumpster rental, we’ll gladly cart it away for you. Just let us know when your dumpster is full and you’re ready to dispose of its contents, and one of our friendly and helpful professionals will promptly arrive at your location to take it away. We Never Refuse your Refuse! At Junk Raps, we not only offer Long Island dumpster rental and carting services, but we also offer junk removal! Has your basement flooded and you need help cleaning it out and getting rid of the items that have been damaged? Do you need a hand cleaning out the contents of your attic that has been accumulating for decades? Have you recently purchased a property that was a short sale, but you need help getting rid of the junk the previous owners left behind before you can use it for your office? Whatever the reason, and whatever type of junk or clutter it is, you can count on the pros at Junk Raps to lend a helping hand. When you need assistance with unloading junk or garbage, give us a call and we’ll be more than happy to assist you. Our crew will arrive at your location, on time, and ready to work. We’ll show up with the equipment and the elbow grease that you need to get the job done. Our team will dive right in and help any way that they possibly can. When you choose Junk Raps for your junk removal needs, you’ll have peace of mind knowing that the job will be done quickly and efficiently. And, you won’t have to worry about dealing with getting rid of the clutter and garbage, because when the job is done, we’ll take it away for you, too! When we say we don’t refuse your refuse, we mean it! We’ll help you unload anything that is cluttering up your home or office, and we’ll see to it that those items are properly disposed of. We’ll load your unwanted items into one of our sturdy and spacious containers, haul it away, and take it to the dump for you. If your items can be recycled, we’ll bring it to the appropriate recycling center. The pros at Junk Raps are just that: Professionals. We have the experience, the equipment, and the know-how that is necessary for all of your junk removal, carting, and dumpster rental Long Island needs. We pay attention to even the tiniest details that other junk removal companies often overlook to make sure that you receive the best service possible. Whether we’re delivering a dumpster, carting one away, or helping you unload refuse, we’ll take care not to damage any surfaces or structures within or surrounding your home or business. And, in the event that an unavoidable accident occurs, Junk Raps is fully insured and will cover the cost of any damages that may occur and needs to be repaired or replaced. We’ll work with your budget, whatever it may be, and we make our schedule around your schedule. At Junk Raps, junk and garbage removal is our passion. We go above and beyond to make sure that the needs of our customers are met, and we will do whatever we can to make sure that you are completely satisfied with the services that we offer. When it comes to de-cluttering and garbage removal, don’t let yourself get overwhelmed; instead, call the experts at Junk Raps. We’ll take the load off of your shoulders so that you can worry about more important things, like remodeling your kitchen, designing your new office, or deciding what to do with all of that space you’re going to have once all of that clutter is gone! Not sure what type of dumpster rental Long Island or junk removal service you need? Just give us a call and one of our friendly and knowledgeable representatives will be happy to answer any and all of your questions. We’ll also provide you with a free estimate. We look forward to working with you and helping you get rid of that unwanted garbage and clutter! We’ll be delighted to turn your trash into our treasure.